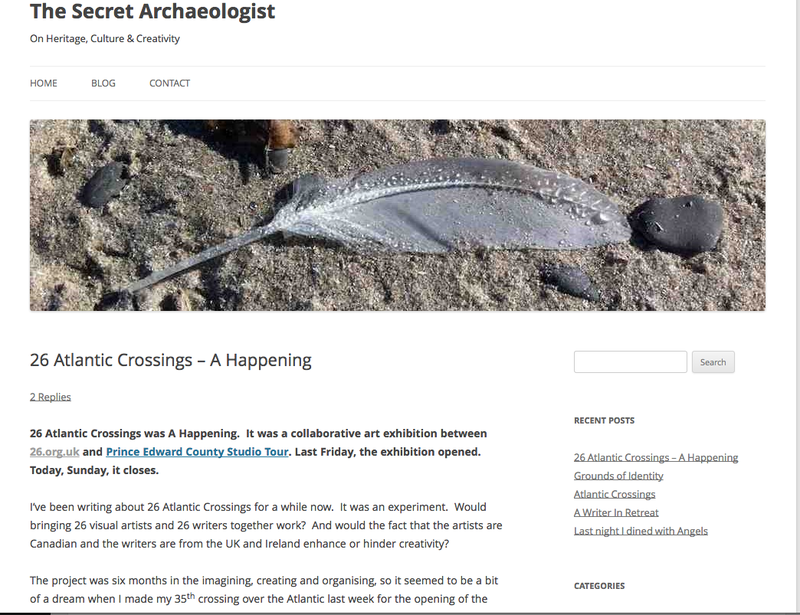 Last Friday saw the launch party for the exhibition 26 Atlantic Crossings, the latest collaborative project from writers’ group 26. The three-day exhibition was in Prince Edward County, Canada, and the only one of the 26 UK-based writers involved able to attend was Faye Sharpe, who – with her artist sister – came up with the original idea and drove the project. Fortunately, Faye has penned a blog piece that lets us enjoy the ‘happening’ vicariously. I’m now anxiously awaiting my copies of the printed book. There are no more copies left, so if you didn’t manage to buy one for yourself and you’d like to explore the art and poetry of 26 Atlantic Crossings, why not download a free e-copy of it here? 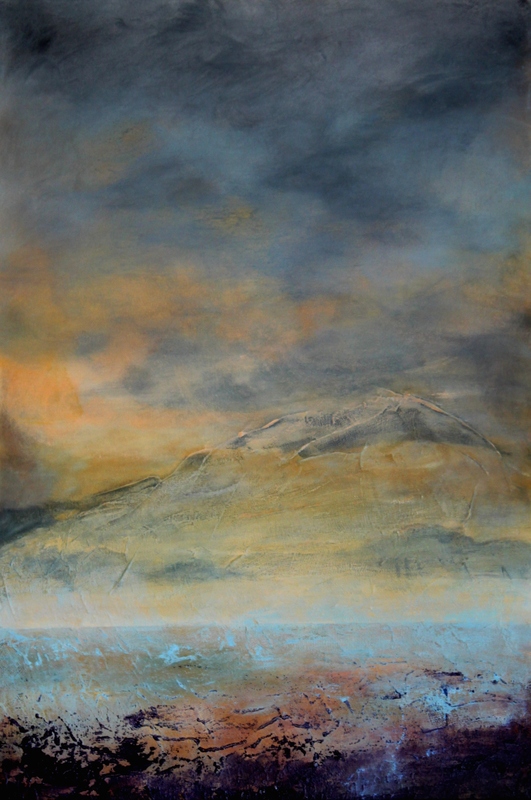 When ‘The Unseen’ (shown below), a painting by Canadian artist Barb Hogenauer, pinged into my in-box last May I felt a sharp pang of homesickness for the dramatic landscape of Céret in southern France, my home for seven years, where the view from my window was of The Canigou (above), sacred mountain of the Catalans. ‘The Unseen’ was my artwork – produced by Barb for 26 Atlantic Crossings, a collaboration between 26 Canadian visual artists and 26 writers based in the UK. You can read my poetic response to ‘The Unseen’, below. Of course, everyone’s response to art is different: I’d be interested to know what Barb’s painting evokes for you. The painting was recently sold, along with a framed copy of my poem, so is now gracing the home of some second generation Canadians, for whom the combination of my words and Barb’s painting had particular resonance, and evoked profound emotions. 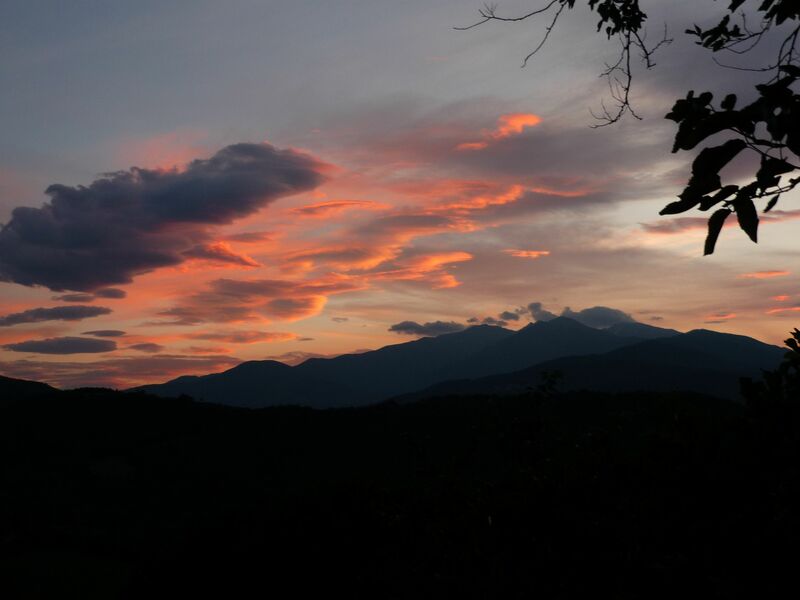 If you’re curious to learn how such a geographically challenging collaboration came about, you might want to read this blog post by project originator, Faye Sharpe. Of course, if you had, by chance, been in Prince Edward County, Canada when the project went live, you may even have visited the 26 Atlantic Crossings exhibition, which featured all 26 artworks alongside their matching sestudes (poems of exactly 62 words – a playful inversion of 26, the writing group’s name, inspired by the number of letters in the alphabet). 26 Atlantic Crossings is the latest in a series of fascinating projects I’ve been lucky to be involved with, organised by writers’ group 26: these range from 26 Treasures, a collaboration with National Museums in England, Scotland, Wales and Northern Ireland (which resulted in a beautiful hard-backed book), to 26 Characters, a project celebrating favourite fictional characters from childhood, at the Oxford Story Museum. You can see more about these projects on my website.